Amelia Deady, Waynflete senior: Class B runner-up in the 100- and 200-yard freestyle. Won 200 and 500 free as a sophomore. 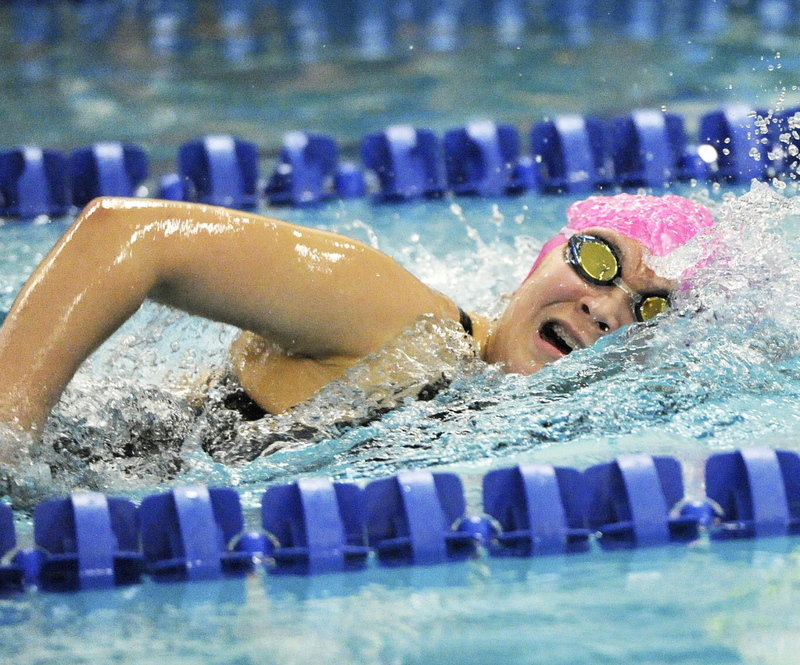 Greely’s Hwanhee Park, just a sophomore, already has distinguished herself as a champion in the 500 freestyle and she figures to only get better for the rest of her high school career, and that’s reason aplenty for Ranger optimism. 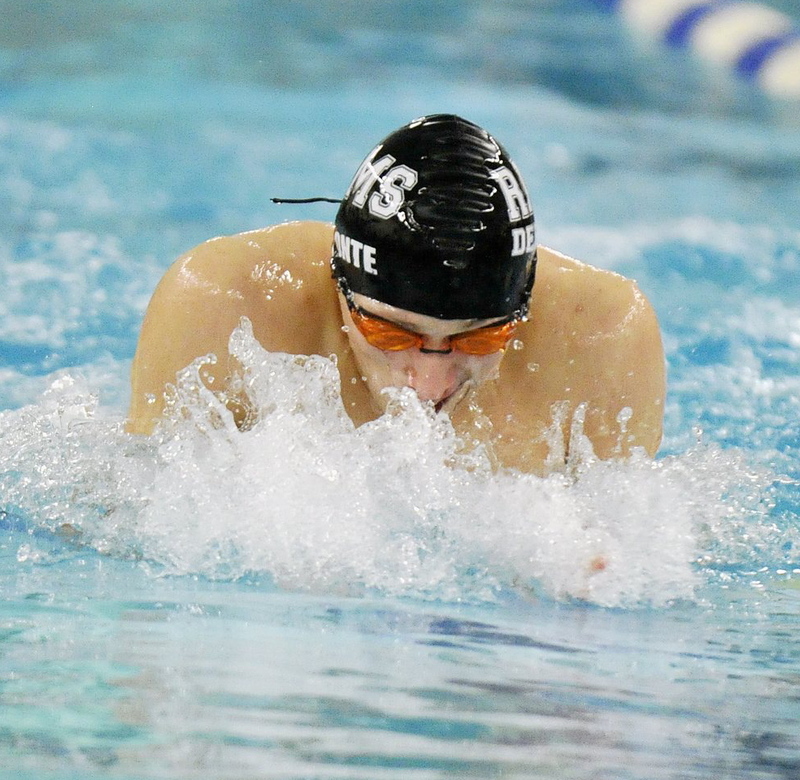 Deering’s Eric Delmonte won the boys 200 yard IM as a sophomore, and he’s back for his senior year with a talented Rams team that should be among the contenders. Charlotte Janelle, Falmouth sophomore: Defending Class B champion diver who scored 335 points at Southern Maine Invitational. Sonia Lin, North Yarmouth Academy sophomore: Set a Class B meet record (1:06.73) in 100 breast and was runner-up in 200 individual medley. Sarah Nappo, Cheverus senior: Set a Class A meet record (57.40) in the 100 backstroke and placed fourth in the 50 freestyle. Hwanhee Park, Greely sophomore: Class B champion in 500 free who also placed third in 200 free to help Rangers finish second to MDI. Lynsie Russell, Brunswick sophomore: Class A champion in 500 free who placed third in 200 free and swam on victorious 200 free relay. Ellen Silk, Waynflete senior: Class B runner-up in 100 butterfly who placed third in 500 free and anchored meet record 200 free relay. Caitlin Tycz, Brunswick freshman: Swam 58.41 butterfly and 2:13:54 individual medley in high school debut. At age 12, set a national YMCA record in the 50 fly. Sydney Wight, Cape Elizabeth senior: Class A runner-up in both 200 free and 100 butterfly who swam on state record medley relay (1:50.17). Lucas Adair, Deering senior: Placed third in Class A 100 butterfly and sixth in 100 backstroke. Eric Delmonte, Deering senior: Class A runner-up in 200 IM who placed third in breast stroke after winning it as a sophomore. Jonathan Dunnett, Greely senior: Class B runner-up in 200 IM who was third in butterfly and anchored winning 400 free relay. Kevin Kane, Cheverus sophomore: Placed fifth in Class A 200 individual medley and sixth in 100 butterfly. Michael O’Donovan, Cheverus sophomore: Class A runner-up in 500 freestyle who placed fourth in the 200 free. Joseph Paluso, Windham junior: Placed third in Class A 500 freestyle and fifth in 100 breast stroke. Jake Perron, Falmouth junior: Defending Class B champion in 500 freestyle who was third in 200 free. Nate Samson, Brunswick sophomore: Class A runner-up in both the 50 freestyle and 100 backstroke. Tim Smith, Gorham senior: Placed third in Class A in the 50 and 100 freestyle. Greg Violette, Westbrook junior: Class B runner-up in 100 freestyle who was fourth in 200 free.